when was the last time you played with GarageBand? I was inspired to revisit the tool. I found it be as fun as it was the first time I played. what was the inspiration? 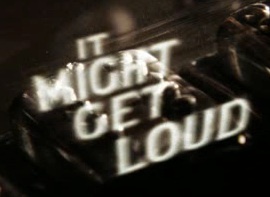 I while ago I was given a real copy of the movie “It Might Get Loud” that features Jack White, Edge and Jimmy Page telling stories and playing guitar. it’s a movie that I didn’t get distracted by outside forces and watched it from beginning to end without doing anything but watch. except I had to pause it about 13 minutes in because there was a mind blow. Edge is showing off his old demo tapes made with a 4 track cassette based tape recorder. the very basis for the band was created on the most basic of recording equipment. and later in the movie Jack White records a one-take on a reel-to-reel deck using a microphone and a guitar. it’s the best modern examples of musicians making with whatever they had. that early Four Track wasn’t the best but it ran on batteries and you could make real songs on it. the reel-to-reel recording shows off that you can make song using any recording technology. the modern equivalent of those recorders is GarageBand (and other apps that are similar to it). GarageBand was released in January of 2004 at Macworld Expo. the demo was captivating. sure, there were other recording sequencers but they cost more, were way more complex and they didn’t come with a new Mac. sure you would eventually hit the wall or the ceiling with GarageBand making you seek a different tool. but this was the same exact thing that happened with MacPaint back in 1984.
simply, that GarageBand comes with every Macintosh is amazing. there are four main functions of GarageBand: recording, virtual instruments, MIDI editing and Music Lessons. you can record your own songs, podcast or practically everything you’d need to record. music is not a requirement of recording. meaning if you need to dictate something GarageBand can do that job. the hardest part about GarageBand is that it’s an instrument. it’s to you to practice using it because it’s not instantly intuitive. so far the best way to get started with it is to watch somebody showing you around. or watch the how-to-videos on Apple. you don’t want to wait until it’s time to record the band for your first time to use it. why? because you’ll want to turn off that annoying metronome. you’ll want to know how to set levels. you’ll need to know how to switch inputs. and anything else that will stop you from recording. you want it to be part of you not something against you. that’s what I did when GB first came out. it took days of my time. I made songs for people. I learned about different effects it had. I found out how powerful it was as an editor and later I recorded podcasts with it. for learning about how to mix multiple tracks there are some very good example files that will help you. multimixing isn’t obvious until GarageBand you may have never been exposed to the task. that’s why you should see how other people do it. Nine Inch Nails and Ben Folds have released real tracks of songs. also Jonathan Coulton released the parts and pieces of Code Monkey. you don’t have to be a fan of the music to play with the tracks as there is lots to learn from having “real” to rearrange. if you want to really get “good” at GarageBand you have to treat it like an instrument and practice. that means making beats, laying down tracks, and arranging things. and you don’t have to download anything extra to do that. there are thousands of loops and beats installed on your Mac already. play everything to get an idea of what it can do. spend an hour every other day. play every loop, play every keyboard, and try out all the amps. use Search to find specific sounds. mess with the effects to see what they do. and change the keyboards to all the different styles. speaking of Keyboard: you don’t need a music keyboard to play the keyboards as you can use your keyboard to do that. Shift-Command-K will bring up a “virtual” one octave keyboard. find the sound set called Radio and press G.
okay so you don’t “need” an instrument to “play it” because it is an instrument. but let’s say you want to. if you don’t already have a electric piano or a guitar please don’t run down to your music store and thrown down money. why? because there have been enough instruments purchased on the road to good intention. instead spend a little time looking for a used axe. these are the instrument that get used for a while, then then get put aside and they sit until the day they need to go. you can always find something unloved for less money which will totally do the job. the bottom line is don’t get big eyes about something that might not like. Garage Band can be a better tool if you do some things to help it. if you have an older Mac dedicate it to your studio. that way it can be set up and ready to go when it’s time to jam. an old iMac G5 with any size screen will do. or an old MacBook. remember the first ones are coming up on 4 years old now. get some control surface(s) like the mini Korg that has knobs, sliders and drum pads. if you want a keyboard watch craigslist or your local want ads. there are always deals to be had. and for recording your voice any of the $100 USB mics are nice. or get an interface like the Fast Track which will allow you to plug in a Mic and a Guitar. Windows? what about Windows! there are Windows equivalents to Garage Band. eventually you may grow up and out of GarageBand. the two versions of Logic will import your GB projects. and any of them can read the raw MIDI files and AIFF files the program creates allowing you recreate your creation.